Build A New Muscular You: Transformation Tips From Two Who've Done It. Learn how to achieve new levels of muscular size and detail very quickly. You should never quit experimenting and trying to find the right training combinations that work for you. Muscular size can be increased with POF and X-Rep training. Johnathan Lawson put on 18 lbs of muscle mass. "I headed to the University of Texas at Austin to get my degree-and while I was at it, I figured I could use the reams of research material in its libraries to figure out how I could build more muscle. Yes, I was still reading the bodybuilding magazines, but most just revealed how the genetically gifted champs trained (20 sets a bodypart, six-days-a-week workouts, blah, blah). I had finally realized, after bashing my head against the no-gain wall for years, that I wasn't one of those mutant easy-gainer types. "For quads it was squats (midrange), sissy squats (stretch) and leg extensions (contracted). I devised simple three-hit programs for almost every major muscle-and lo and behold I started growing. In fact, I won the first bodybuilding contest I entered using an early version of Positions of Flexion, my tongue-twisting but accurately descriptive name for it. It was a very small local show with about nine competitors, but what an accomplishment for a guy who could've been the model for pirate flags only a few years earlier. "After I graduated with a journalism degree and became the editor of IRON MAN magazine, POF continued to evolve (as did IRON MAN-I tried to gear it toward telling the truth and printing more than just 'champ' training). My prestigious position fueled my mission to make POF the most efficient mass-building workout protocol out there. As IM editor in chief, I got to interview Arnold (who's favorite biceps routine was barbell curls, incline curls and concentration curls-POF), Cory Everson, Boyer Coe (who at one time worked for Arthur Jones at Nautilus), Lee Labrada (an intensity-training advocate) and Tom Platz (a big fan of extended stretch exercises-a key position in POF-for his freaky quads). "Yes, they were the genetic elite, revealing what had worked for them, but I had learned to pick and choose what average trainees could use to build muscle. I applied ideas from each of them. I honed POF to a level that I thought was the best it could be and with it had built my physique to its genetic limit-or so I thought. I figured that with my marathon-runner genetics, looking kind of like a bodybuilder, but not really, was it for me. 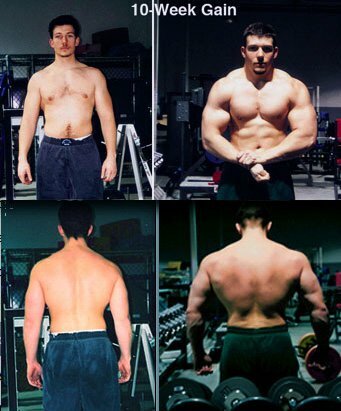 "Then, after training with Jonathan for a few years, more or less maintaining my medium-muscled physique-first photo below-and focusing on helping him get bigger and win some drug-free bodybuilding contests using POF, we stumbled onto X Reps, which are basically moving the weight to the semistretch position at exhaustion and continuing with partial reps to end the set. Suddenly our physiques took giant leaps. Suddenly Our Physiques Took Giant Leaps. "We both achieved new levels of muscular size and detail very quickly. After only one month using POF training with an X-Rep chaser, I was amazed that suddenly I looked more like a bodybuilder, and I was in my mid-40s (second photo above). Every bodypart was fuller and more etched, no steroids..."
"Like most teenagers who start bodybuilding, I wanted to be so big and muscular that jaws would drop when I walked on a beach. Whether you're young or old, a muscular physique is a great way to get noticed and elevate self-esteem. I also had dreams of competing in the sport of bodybuilding. After I'd been lifting weights for a few years and had progressed to a respectable level of size and strength, that dream seemed to be a little closer, but many told me I needed 'extra' help to get there. I didn't listen. I refused to resort to bodybuilding drugs. They were out of the question (and still are) for me because the rewards simply weren't worth the risk. I decided to rely solely on training and nutrition. I Refused To Resort To Bodybuilding Drugs. "At age 19 I entered my first contest-with lots of prodding from friends and family. I didn't place well, which I expected because I knew I needed more muscle size if I wanted to make a strong showing. I entered anyway, primarily for the experience that would help me in later contests once I achieved my goals - without drugs. I keep emphasizing my drug-free status because, as any competitive bodybuilder knows, the thought of using anabolic steroids - as well as the 'what if' possibilities-are always there. The bodybuilders at my gym who used such drugs continued to tell me I couldn't compete successfully without them. I tried not to listen, but their words echoed through my mind almost daily. Rather than succumb to the temptation, however, I used their words to fuel my workout intensity. They only made me stronger in my conviction that I could do it drug-free. "While I did improve my physique, the real size I was seeking didn't materialize no matter what I tried. I began to think that the drug users at the gym were right, that it was impossible to build exceptional size and strength without anabolic steroids. Rather than risk my health and convictions, I let my training gradually slack off and fall by the wayside. 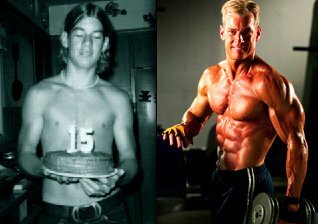 By the time I was 21, my bodyweight had leveled off at a soft 190 pounds at 5'11", and I began to refocus my priorities. "As chance would have it, I got a job in the product division of Iron Man magazine and met Steve Holman, the editor in chief. He told me he had developed programs that could add pounds of muscle to just about anyone's frame in a few months. Talking to Steve motivated me to start training hard again, and here's the real kicker: I then convinced him to train with me. When he agreed, I felt a wave of motivation unlike any I'd ever felt before. 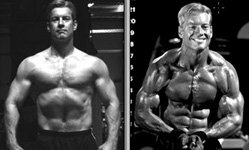 Steve had developed the Positions-of-Flexion muscle-building system, so I had a good feeling that he could help me take my muscle size and strength over the top. My Muscle Size Took A Radical Leap. "I added almost 20 pounds in 2 1/2 months. My bodypart measurements and strength increases also amazed me: arms, up 1 1/4 inches; thighs, up 1 1/2 inches; waist, down one inch; bench, up from 200 x 10 to 290 x 6; squat, up from 205 x 8 to 335 x 7. Unbelievable-and I did all that in 10 weeks with no steroids, just hard, sensible training, a regimented eating schedule and a few choice supplements. Considering my sputtering progress in the past, these gains were miraculous. "Adding new muscle that quickly felt incredible. Thanks to the IRON MAN Training & Research Center, Steve and POF, I've been very successful in my bodybuilding endeavors since my initial POF Size Surge odyssey. In fact, with many of the refinements, such as new POF bodypart programs, X Reps and X-hybrid techniques, I've achieved the physique I've always dreamed of having-hard and ripped at around 210 pounds (note that I had 10 percent bodyfat at that weight after the 10-week program, but new innovations, like X Reps, have helped me go above and beyond that)! And my arms measure over 19 inches now; however, I'm striving to be even better, which is what bodybuilding is all about." I'm Striving To Be Even Better. In other words, one minor tweak can add to your physique. Notice that in Jonathan's 10-week transformation he moved from a basic anabolic-primer program that he used for five weeks to a more elaborate POF program, with midrange-, stretch- and contracted-position work for each bodypart. "Dedicated to Your Physical Transformation"
This is backing off after every four to six weeks of all-out training. Jonathan used that strategy in his 10-week transformation as well. 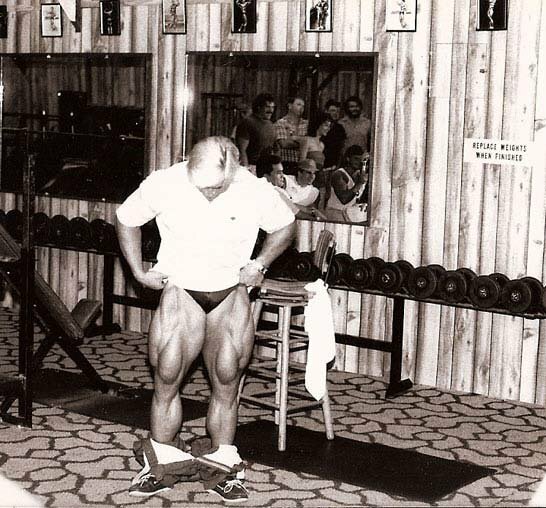 He trained all out for four weeks, then used the same weights the fifth week but stopped every work set two reps short of failure. That allowed his nervous system to stay primed for heavy poundages, but by not going to exhaustion his muscles and nervous system were allowed to recover completely, setting up a perfect growth scenario for his second five weeks using POF. He also backed off the final week of the 10-week cycle. Those exercises don't allow the muscle to rest during a set, which blocks blood flow. Once the set is over, blood rushes in, producing a big pump. That type of tension/occlusion exercise builds the endurance components of the type 2A fast-twitch fibers, such as capillary beds and mitochondria, so you get muscle growth along another pathway. You also get more muscle burn, which has been shown in research studies to boost anabolic hormone release. In one animal study, researchers produces a 300 percent muscle-mass increase after only one month of progressive-stretch overload "workouts." Stretch exercises have also been linked to anabolic hormone release in muscle tissue. [ Click here to learn more. ] Get A Muscle Mass Fix With Scientific Muscle Morphing! 3D Positions of Flexion (POF) is a simple concept based on real science that attacks all the layer of muscle growth with precision.